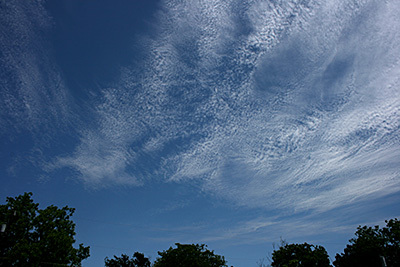 Detached clouds in the form of white, delicate filaments, mostly white patches or narrow bands. They may have a fibrous (hair-like) and/or silky sheen appearance. Cirrus clouds are always composed of ice crystals, and their transparent character depends upon the degree of separation of the crystals. As a rule, when these clouds cross the sun's disk they hardly diminish its brightness. When they are exceptionally thick they may veil its light and obliterate its contour. Before sunrise and after sunset, cirrus is often colored bright yellow or red. These clouds are lit up long before other clouds and fade out much later; some time after sunset they become gray. At all hours of the day Cirrus near the horizon is often of a yellowish color; this is due to distance and to the great thickness of air traversed by the rays of light. Thin, white patch, sheet, or layered of clouds without shading. They are composed of very small elements in the form of more or less regularly arranged grains or ripples. Most of these elements have an apparent width of less than one degree (approximately width of the little finger - at arm's length). In general, Cirrocumulus represents a degraded state of cirrus and cirrostratus, both of which may change into it and is an uncommon cloud. 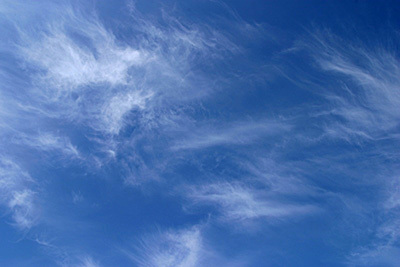 There will be a connection with cirrus or cirrostratus and will show some characteristics of ice crystal clouds. 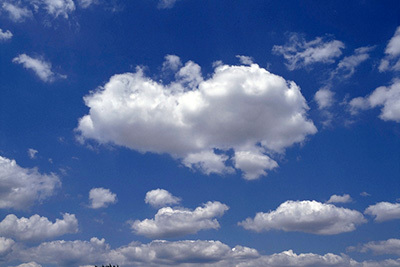 Transparent, whitish veil clouds with a fibrous (hair-like) or smooth appearance. A sheet of cirrostratus which is very extensive, nearly always ends by covering the whole sky. During the day, when the sun is sufficiently high above the horizon, the sheet is never thick enough to prevent shadows of objects on the ground. A milky veil of fog (or thin Stratus) is distinguished from a veil of Cirrostratus of a similar appearance by the halo phenomena which the sun or the moon nearly always produces in a layer of Cirrostratus. White and/or gray patch, sheet or layered clouds, generally composed of laminae (plates), rounded masses or rolls. They may be partly fibrous or diffuse and may or may not be merged. Most of these regularly arranged small elements have an apparent width of one to five degrees (larger than the little finger and smaller than three fingers - at arm's length). When the edge or a thin semitransparent patch of altocumulus passes in front of the sun or moon, a corona appears. This colored ring has red on the outside and blue inside and occurs within a few degrees of the sun or moon. 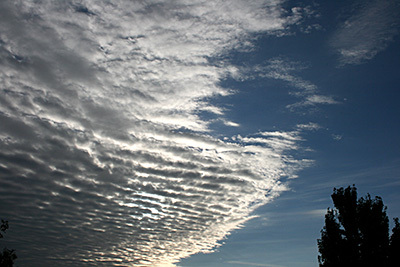 The most common mid cloud, more than one layer of Altocumulus often appears at different levels at the same time. Many times Altocumulus will appear with other cloud types. Gray or bluish cloud sheets or layers of striated or fibrous clouds that totally or partially covers the sky. They are thin enough to regularly reveal the sun as if seen through ground glass. 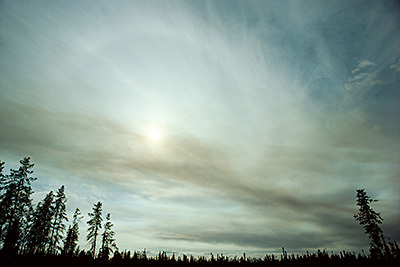 Altostratus clouds do not produce a halo phenomenon nor are the shadows of objects on the ground visible. Sometime virga is seen hanging from Altostratus, and at times may even reach the ground causing very light precipitation. 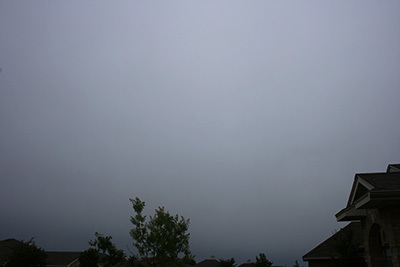 Resulting from thickening Altostratus, This is a dark gray cloud layer diffused by falling rain or snow. It is thick enough throughout to blot out the sun. Also, low, ragged clouds frequently occur beneath this cloud which sometimes merges with its base. 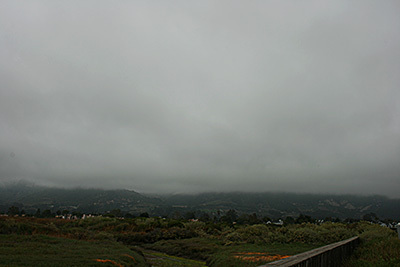 The cloud base lowers as precipitation continues. Because of the lowering base it is often erroneously called a low-level cloud. 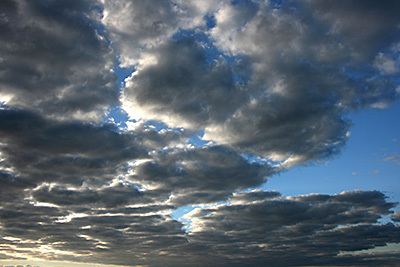 Both Altostratus and Nimbostratus can extend into the high level of clouds. Detached, generally dense clouds and with sharp outlines that develop vertically in the form of rising mounds, domes or towers with bulging upper parts often resembling a cauliflower. The sunlit parts of these clouds are mostly brilliant white while their bases are relatively dark and horizontal. Over land cumulus develops on days of clear skies, and is due diurnal convection; it appears in the morning, grows, and then more or less dissolves again toward evening. The thunderstorm cloud, this is a heavy and dense cloud in the form of a mountain or huge tower. The upper portion is usually smoothed, fibrous or striated and nearly always flattened in the shape of an anvil or vast plume. Under the base of this cloud which is often very dark, there are often low ragged clouds that may or may not merge with the base. They produce precipitation, which sometimes is in the form of virga. 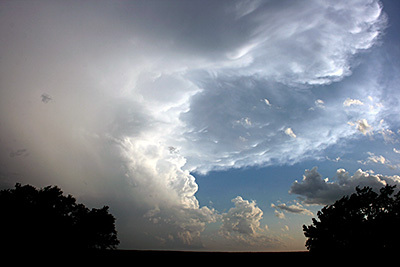 Cumulonimbus clouds also produce hail and tornadoes. Gray or whitish patch, sheet, or layered clouds which almost always have dark tessellations (honeycomb appearance), rounded masses or rolls. Except for virga they are non-fibrous and may or may not be merged. They also have regularly arranged small elements with an apparent width of more than five degrees (three fingers - at arm's length). A generally gray cloud layer with a uniform base which may, if thick enough, produce drizzle, ice prisms, or snow grains. 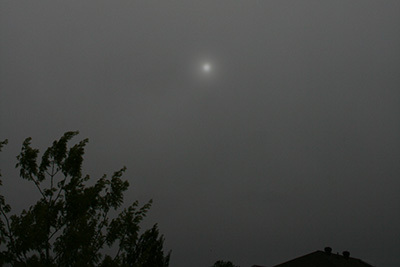 When the sun is visible through this cloud, its outline is clearly discernible. Often when a layer of Stratus breaks up and dissipates blue sky is seen. Sometimes appearing as ragged sheets Stratus clouds do not produce a halo phenomenon except, occasionally at very low temperatures.